MANILA, April 28 (PNA) -- President Rodrigo Duterte on Friday welcomed Indonesian President Joko Widodo in Malacañang for a bilateral meeting ahead of the 30th Association of Southeast Asian Nations (ASEAN) Summit and Related Meetings. The Palace said the bilateral meeting between Duterte and Widodo will be an opportunity for the two leaders to continue discussions started during the President’s state visit to Indonesia in September 2016. Presidential Spokesperson Ernesto Abella said that among the bilateral issues the two leaders will discuss during the restricted meeting include security concerns in the Sulu-Sulawesi seas, the war on illicit drugs, maritime cooperation, enhancing economic ties, and intensifying people-to-people exchanges. The case of Mary Jane Veloso is also expected to be discussed. Also part of the agenda will be the signing of the Memorandum of Understanding (MOU) on Agricultural Cooperation and the Joint Declaration on the Establishment of Sea Connectivity between Davao/General Santos in the Philippines and Bitung in Indonesia. The MOU on Agricultural Cooperation aims to strengthen the development of both countries' agricultural sectors through cooperation on agricultural research, mutual consultation and assistance. Meanwhile, the Joint Declaration on establishing a sea linkage route between the Philippines and Indonesia encourages the establishment of direct sea connectivity between the cities involved, the designation of their ports for this purpose, regular consultation, and undertaking measures to ensure that certain safety standards are met. As part of the joint declaration, Duterte and Widodo will grace the formal launching of the Davao-General Santos-Bitung roll-on/roll-off (RORO) sea linkage route on Sunday in Davao. After the bilateral meeting, the two leaders will meet the press for a joint statement. 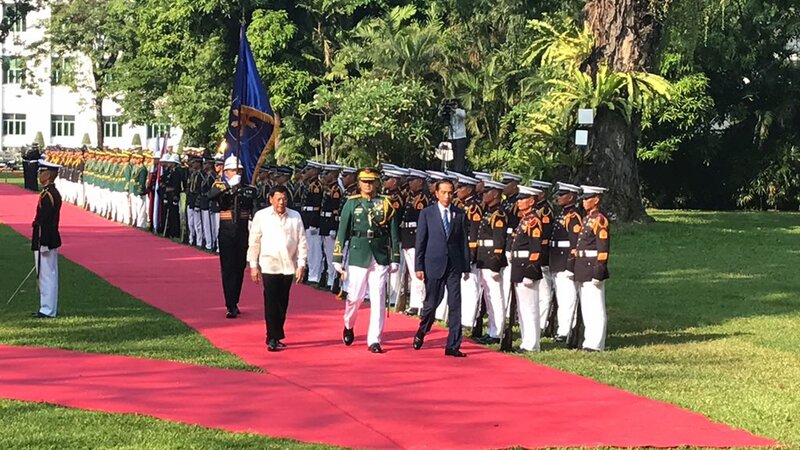 A state banquet will be hosted by President Duterte for President Widodo and his delegation, which includes Indonesian First Lady Iriana Widodo, in Malacañang’s Rizal Hall at 7 p.m..
Widodo is the second ASEAN leader to pay a state visit to the Philippines.